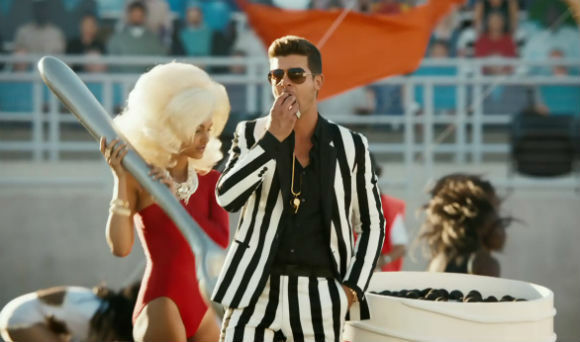 Robin Thicke has released a video for his latest single, “Give It 2 U”, featuring 2 Chains and Kendrick Lamar. The song is the follow-up to the title track from “Blurred Lines”, the biggest song of summer 2013 with 11 weeks at the top of the Billboard Hot 100. Directed by Diana Martel, the video was filmed in Los Angeles and features mini-parade floats, cheerleaders, dance teams from Albany and Alabama State and Thicke's own son, three-year-old Julian Fuego. "The thing about Diane Martel that makes it so amazing — besides just being a crazy genius — is that she combines all different parts of the world into one soup," Thicke told MTV from the video shoot. "She takes the cotton candy, she takes the beautiful football-playing girls and she mixes it all up into onebeautiful pot. So we're all very lucky to have her and excited to be working with her again."